This installment of Purple Duck Games‘ „…of Porphyra“-series clocks in at 32 pages, 1 page front cover, 1 page editorial, 2 pages of SRD, leaving us with 28 pages, laid out in 6’’ by 9’’ (A5), so let’s take a look! After a brief one-page introduction, we begin with the archetype section, the first of which would be the descendant. This one represents an engine tweak, gaining a bloodrager bloodline at first level, which is governed by Wisdom instead of Charisma, gaining bloodline powers at 1st and 4th level and every 4 levels thereafter. For the purpose of SPs etc. gained thus, class level equals character level. This replace the 1st level bonus feat and the ki powers gained at 4th level and every 4 levels thereafter. Powers entwined with bloodrage instead work in conjunction with ancestral communion, which may be entered as a free action, which can be maintained for 4 + Wisdom modifier rounds per day, +2 rounds for every subsequent class level attained. Ancestral communion nets a +2 morale bonus to Strength, +4 to Will-saves and +2 to Fort-saves. This replaces flurry of blows. Bloodline feats may be chosen as monk bonus feats. At 6th level, the character can spend a ki point to cast the first bonus spell granted by the bloodline as a SP, noting once more, correctly, how this is governed by class level and Wisdom, with 10th level, 14th and 18th level unlocking further bonus spells at progressively increasing ki costs. This replaces the ki powers gained at these levels. All in all, this is a solid engine-tweak. Next up would be the Firefall monk, also known as Qunbalati. These monks replace Perform with Disguise as a class skill, and the AC-bonus is reduced to only the Wisdom bonus. Instead of flurry of blows and stunning fist, the archetype gains the throw anything and bomb class features of the alchemist, using class level as alchemist level to determine their potency, and Wisdom modifier as governing attribute. This stacks with other bomb-granting abilities. As a rules-aesthetic complaint, the unchained monk’s chassis does not actually require bombs to be relevant – as a full BAB-class, the bombs hit very reliably, which presents a similar disjoint as the gunslinger. That as an aside, the qunbalati gains ki pool at 7th levl, treating his unchained monk level as 4 lower for the purpose of ki points and ki strike; the archetype also does not gain ki powers of 4th, 6th, 8th and 12th level. At 3rd level, the archetype adds Wisdom modifier to Reflex saves trying to reduce the damage dealt by his own bombs; at 8th level, this applies to all Reflex saves to which evasion applies. Starting at 6th level, as long as the qunbalati has 1 ki point, he does not provoke AoOs with bombs; at 12th level, while having at least 2 points, bombs may be thrown as a move action; at 16th level, while having at least 2 ki points, you can throw a bomb as a swift action – these are relevant in the absence of discoveries, obviously. Thirdly, we have the flying monk, who is locked into Dodge and Mobility at 1st and 2nd level regarding bonus feats, ignoring prerequisites. The archetype gets the first real signature ability at 5th level – when doing a flurry, the archetype can jump sans provoking an AoO, necessitating a DC 20 Acrobatics check when threatened. On a failure, the flurry stops and larger enemies increase the DC. At 10th level, an additional jump may be attempted per flurry, with at least one attack between them, but this second jump costs ki. The number of ki you can spend per round is capped by Wisdom modifier, and the ability replaces 5th level’s style strike and 10th level’s ki power. At 8th level, the archetype gains acrobatic dodge, which is cool: Once per round when attacked by a melee attack, the character can attempt a DC 25 Acrobatics check – on a success, the character gains +4 dodge bonus to AC versus the incoming attack. This, however, does count as a move action taken in the next round – at least until 15th level, where succeeding the check by 15+ means that it does not consume next round’s option AND allows you to attempt it again. This replaces 8th level’s ki power and 15th level’s style strike. I liked the idea of this ability – I just wished it would become available sooner. Martial virtuosos may select Style feats as bonus feats, and 6th level allows for Adept of Many Styles (enter a style, use feats based on that style as well as another), 10th level for Master of Many Styles (ditto, for two additional styles, + 1/round style switch as a free action) as bonus feat options. Starting at 4th level, the archetype reduces the number of skill ranks required by a Style feat by Wisdom modifier, with the option to split the reduction between skill prerequisites – this is interesting and replaces still mind. At 6th level, the character gains stance breaker instead of a ki power: Once per round when attacking an enemy that has adopted a style, the archetype can break a style, knocking a hit foe out of it and preventing reassertion of the style for a few rounds – this is particularly interesting if you’re using a system that employs style-like stances and extend the benefits to these. At 10th level the duration of style-lockdown, and at 14th level, two style lockdowns may be executed per round, with additional uses beyond those requiring more ki points. The naginata master gains proficiency with naginatas, long spears and similarly weaponry and treats weapons with the reach property as monk weapons, which becomes relevant at higher levels. 8th level allows for the use of ki to enhance these weapons as though they were fists. At 12th and 20th level, these weapons are treated as + one size category . The archetype does lose stunning fist and unarmed strike. 4th level yields Favored Weapon for a reach weapon…which is not a feat I am familiar with. I assume this to reference Weapon Focus, though it is possible that it instead references e.g. the marksman’s favored weapon class ability, which isn’t a feat. Unpleasant hiccup. At 16th level, we have the option to expend reach by 5 ft. for one round as a swift action. The pinyinist comes with some racial restrictions in Porphyra, excluding some of the weirder races sans classic humanoid physiology from taking the archetype. There is a reason for that: At 4th level, the archetype gets ki meridians, which may be activated by spending a ki point as a swift action and last for Wisdom modifier rounds. One is chosen at 4th level and every 4 levels thereafter, replacing the ki powers that would usually be granted at these levels. 1/day gaining of two ki points, DR, skill or initiative boosts – the benefits are pretty traditional, but the flavor makes them interesting. As a nitpick, I’m not too happy with the bonuses granted being untyped. At 6th level, and again at 10th and 14th, the pinyinist opens a meridian chosen permanently, losing the ability to open them. Kudos: Those that would become really problematic otherwise get unique benefits from being permanently open. 12th level extends the meridian list by a further 6 entries, once more corresponding with organs of the body. Building on that, 18th level provides the means to activate meridians that have been permanently opened for combined boosts, once more featuring a few unique tricks. I love the flavor of this one and the base of the engine, if not necessarily the execution – it could have carried a whole class. The void monk adds Autohypnosis to the class skills (something that would point towards the Naginata specialist indeed referring to the marksman class feature erroneously as a feat) and has a bad Ref-save, but a good Will-save. Instead of evasion, the monk may substitute an Autohypnosis check for a Will-save, which is mechanically not that smart – as noted time and again before, skill checks are notoriously easy to break. Instead of improved evasion, the void monk gets the means to resist probing into his mind, requiring that any entity attempting to do so succeeds at a massive Sense Motive skill check. Instead of diamond body, the archetype gains no breath. Nice ideas here, though I wished the archetype had a bit more active tricks going on. Next up would be the Grasshopper 10-level PrC, which requires BAB 5+, 5 ranks Acrobatics as well as evasion and flurry of blows. The PrC gets d10 HD, 4 + Int skills per level (with a paltry 3 class skills), and does not gain new proficiencies. The PrC has full BAB-progression, as well as ½ Fort- and Ref-save progression. The PrC allows for the addition of both Dexterity and Strength modifiers to attack rolls executed with flurry of blows at 1st level, which, from the get-go, is problematic – this would have made sense for non-unchained monks, but not for the already full BAB unchained monk. The PrC has a ki pool of ½ class level + Wisdom modifier, and thankfully, the ability gets interaction with the ki pool class feature granted by other abilities right. Unarmed strike, flurry and stunning fist scale as though the PrC-levels were unchained monk levels. 2nd level nets a +1 deflection bonus per free hand. Nitpick: The deflection bonus is stated as being cumulative, which could be read as pertaining to the ability (which seems very likely) or as pertaining any deflection bonuses. A more elegant variant would have been to state that the bonus equals the number of free hands, or alternatively increases a deflection bonus accordingly. This would aso have made the interaction with the follow-up ability smoother. At 6th level, while getting at least a +1 deflection bonus from a free hand, they also add Strength modifier as a stacking bonus to AC. Then again, that’s me nitpicking. At 3rd level and every 2 levels thereafter, the PrC gets to choose a ki power from a limited list. There are a couple of PrC-exclusive ones here: Better jumping, ignoring gravity changes (cool), double jumping mid air via ki, create shockwaves (and fissures! ), ignoring limited DR, a variant one-strike flurry powered by ki (with a minor formatting glitch) , maneuvers, alternate kick-damage type…the tricks are cool, with the exception of one of the powers, which just represents a numerical escalation. 4th level nets the ability to hover via ki, and even temporarily fly. Cool and gets maneuverability etc. right. At 6th level, while getting at least a +1 deflection bonus from a free hand, they also add Strength modifier as a stacking bonus to AC. 8th level adds +1 attack to the flurry of kicks, and at 10th level, a flurry can be combined with standard or move actions when attacking with feet only; the action may not imply movement or use feet, which is an uncommon, interesting limiter. The action may also not be used for combat maneuvers or melee attacks, but ranged attacks, potion drinking, etc. are viable. There is a second PrC here, the wild master, who requires flurry of blows and wild shape, as well as 5 ranks in the Knowledge (nature) skill. The PrC gets d10 HD, 4 + Int skills per level ½ spellcasting progression for the druid class, full BAB-progression, and half Fort- and Ref-save progression. The PrC nets no new proficiencies. The PrC can use flurry of blows with natural attacks while in animal form (important limit!). At 4th level, natural attacks when flurrying, are treated as +1 size, with 8th level increasing this to +2 sizes. Class levels stack with unchained monk levels for unarmed strike, stunning fist and flurry of blows. ½ class levels stack with druid levels for the purpose of wild shape. The 3rd level nets favored shape nets a choice of 8, which include bears, felines, etc., but oddly no canine specialization. The bonuses they convey to the respective shapes are concisely presented. 5th level and every 2 further levels yield another such favored shape. At 4th level, while in a form that is not the standard form, the PrC can use wild shape as a swift action. At 8th level, when assuming the form of an animal, all animals of that type in a 60 ft. radius gain +2 to atk and damage, which is a bit rough, considering that “fish” or “raptor” are categories, whereas “bear”…is pretty singular. 10th level nets timeless body and adds Wisdom modifier to AC and CMD (stacking) as well as to some skills. I did not like this PrC. It’s very numbers-focused and not that interesting. The pdf also contains 7 new ki powers, which include making weapons temporarily count as monk weapons via ki expenditure to sacrifice hit points to regain ki, with a daily cap. Personally, I think the damage should scale, but at least the hard cap prevents total delimiting of the ki-resouce. Still, that’s up to + Wisdom modifier ki, which can be rather brutal. Temporarily seeing via ki is interesting, though I think that just referring to all-around vision would have been more elegant here. Pinyinist-support for more meridians, wall running and allowing the monk to train weapons, using them as monk weapons on a semi-permanent basis complement this section. The final chapter deals with new feats: I already mentioned the Many Styles-feats; beyond these, there is one that fortifies you against massive damage. Very problematic: regaining ki via crits. Ki is not grit; it’s a limited resource and as such, should not be able to be recharged via critical hits. Worse, the feat lacks a caveat to prevent abuse via bags of kittens: Whip out the bag and start beating up your fluffy friends – it’s for the greater good. Enhanced Dodge is a joke. +1 dodge bonus while you have at leats 4 ki. Yeah, let’s waste a feat on that. Faster Flurry of Blows nets you +1 attack at highest BAB against a foe after hitting a single target at least thrice with a flurry. Unstoppable Flurry of Blows builds on that, for 6 attacks. There is also a feat that lets you use ki to enhance channel energy. The chapter’s main meat, however, would be the 5 imperial styles: In Porphyra, these are considered to be noble arts, and they include Underworld Style (flanking prevention and enhancers), Sovereign Style lets you declare attacks as fake, making them work as Intimidate checks instead. (Erroneously referred to as Intimidation here, but that’s a nitpick.) Combining the style with Everyman Gaming’s psychology rules from Ultimate Charisma makes it even more interesting. Like it. Sky Style focuses on falling/dive bombing on your enemy for potent attacks, unlocking jumps to trigger the benefits. It, like Sea Style focuses on underwater/in water combat, with swim speed and bonus damage in water (which is a pretty nasty numerical escalation). Forest Style is interesting, enhancing attacks versus larger foes (or those higher up) and nets you the means to effectively deal with being prone, etc. Editing and formatting are very good on a formal and rules-language level – the Purple Ducks have made sure that the content is functional and solidly-phrased. There are only a few minor hiccups here. Layout adheres to a 1-column, printer-friendly b/w-standard with purple highlights. The pdf sports some really nice full-color artworks. Annoyingly, the pdf lacks bookmarks, which constitutes a comfort-detriment. 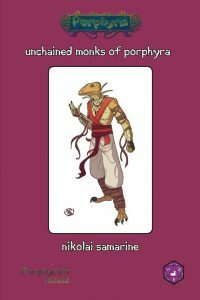 Nikolaï Samarine provides a solid expansion for the unchained monk here – it’s somewhat hybrid-concept heavy for my tastes, but mostly handles the task of presenting viable options well. That being said, it’s most interesting when it dares to do something thematically unique – the Pinyinist is, for me, the star here, theme-wise. That being said, the supplement is pretty technical overall – there is a lot of tweaking with numbers, and there is a general tendency towards escalating the numbers, particularly for offense, which isn’t as smart a move in a system already geared towards offense. That being said, while this shows that the author is not yet a veteran, you can see a burgeoning daring here, one that I can see develop into intriguing supplements. As presented, the book is, as a whole, represents a mechanically well-crafted offering that can be somewhat problematic in the hands of min-maxers. The supplement, as a whole, to me represents a mixed bag, and I feel that it’s closer to rounding down than up from my final verdict of 3.5 stars.